Hi friends! It's a very special Monday today... it marks the 500th Mojo Monday sketch! Wow! I've been working toward this goal for quite some time - just a few months shy of 10 years. I've had so much fun sharing my sketches with you over the last decade. But as the seasons in my life have changed, I've realized that even good things must eventually come to an end. So this will be our final Mojo Monday challenge. I am so grateful to all of you who have participated over the years. I have loved peeking in at your cards each week and watching you grow as artists. Thanks so much for sharing and thanks for letting me be a part of your crafting for so long! The words are hard to come by and even harder to type, so I'll send you on over to the Mojo Monday blog post today if you want to read a little bit more. Now I'll move on to the easier stuff... my card for the challenge. It's a contest week and we've extended the challenge deadline to 2 weeks to give y'all a chance to participate. 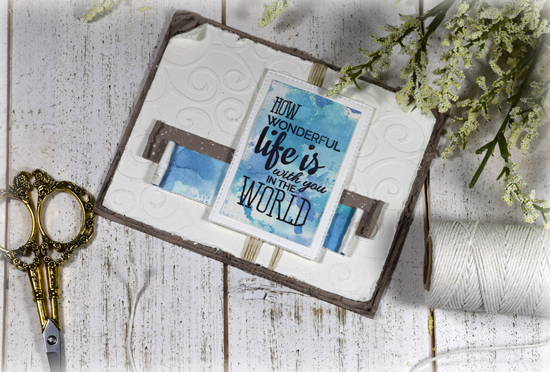 Play along for your chance to win a Verve stamp set. I was feeling overwhelmed sitting down to make this final Mojo Monday card. Mark jokingly said, "No pressure. You just need to make the best card you've ever made." LOL Well, I'm not sure I achieved that lofty goal, but I do like the end result! Choosing a stamp set to start was the hardest part. This sentiment from Wonderful Marvelous kind of summed up how I was feeling about everyone who has played along in this challenge over the past almost 10 years. I've been wanting to play in the TCP Tuesday #336 Sand, Sea and Sky challenge, so started with that as my inspiration. I had to flip the sketch horizontally to fit my sentiment. The sentiment background and horizontal strip is done with distress oxide inks in broken china and faded jeans and I stamped the sentiment in archival ink. I added some white paint splatters to the tip top strip, then distressed the edges and rolled the ends as if they were maps or scrolls. I'm pretty sure this was one of my very first Cuttlebug folders. Love the wavy feel to it, and I tied some hemp twine around to add to the beachy theme. It has a really beachy masculine feel, which I think will be perfect for my Dad for Father's Day. WOW -- 10 YEARS! You and your sketches have helped to make many beautiful cards. While I am sad the sketches are leaving, I know stampers will use them for years to come (me included) -- thank you for all you have done to help build this industry to what it is today! This is bitter sweet for me also. I've always love playing with the mojo challenges and will miss the sketches. However, I've been in the same situations as you with my kids as they were growing up. Do what you have to do because you will never get those times back again. Thank you so much for the work you've done with these sketches. See you at your other places...Hugs to you! So does this mean the week will start with Tuesdays because I can't imagine not having Monday without you and Mojo! Mojo Monday has been a wonderful help and inspiration to me, Julee, and I will sure miss the challenges and ideas. Mostly, I will miss you and your kind words. Sounds like this is a wise decision and please thank your family for sharing you. Beautiful, Julee and indeed life is beautiful and enjoy it to the fullest. Thanks for 500 wonderful sketches! Beautiful card Julee and a special sentiment. So sorry to see Mojo Monday go, but I completely understand. You are a very busy lady with twin boys and the rest of things in your life. Thank you for 500 great sketches and I am glad you will still have your blog and also Verve stamps (love them). 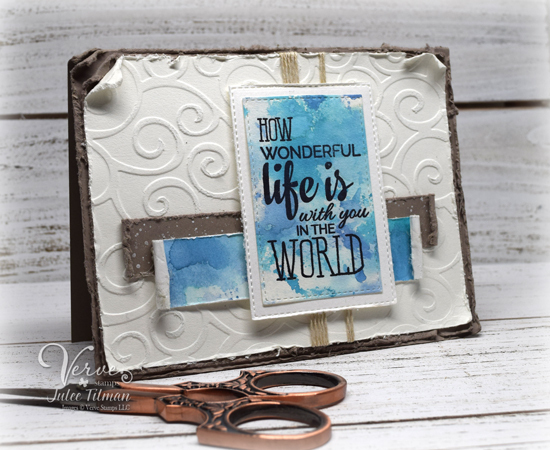 your work is always amazing Julee-from your cards to your Verve stamps to your Mojo sketches. I have used them often to create a card for the color challenge on SCS. I will miss the sketches along with everyone else. But there are still 9.5 years worth on line for us all to enjoy. You have made the right decision to put your boys first. They grow up way too fast. Gorgeous card in that Julee style I love! Thanks for a beautiful card. congratulations on 500 sketches, for me it has been a challenge for some sketches and others came right to mind when I saw it. You enjoy these little ones of yours the time you spend with them now will be great memories for all of you. I started card making after most of my girls were out of the house and my 4th was a teenager. Thank you for the many years of sketches. Love your style. Your cards are always beautiful! I respect your decision. Children are a blessing and every minute matters. Blessings to you and your family. Lovely Card...going to miss you all...it has been a good learning process for me...I've have grown thanks to all of you! Signing up so I don't miss your lovely work! First off, thanks for all the years of Mojo Monday. It has served as inspiration for me many times. Second, your card is beautiful. I love the blues, so perfect for water or sky. Thanks so much for joining us for TCP Tuesday over at The Cat's Pajamas!